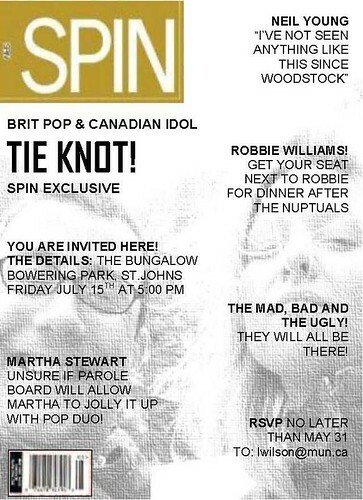 Brit Pop Star To Wed Canadian Idol! request, originally uploaded by Theoddcouple. So we never really got them out when we said we would...we found a teeny weeny spelling error (does this surprise you?) and as am officially BRIDEZILLA, this certainly wouldn't do. They all had to be printed out. AGAIN. So I hope you have received it. If you have'nt, blame Canada Post. Or Marcus. I blamed Marcus when my grandfather demanded to know exactly WHO was the "Mad the bad and the ugly". It really doesn't mean anyone in particular and its just how the British might say "everyone and their dog will be there". Am I right Marcus? Or did you just tell me that so I would'nt force you to re-print the lot. Nevermind. I think they are great. Thanks again to Marcus who was zee master mind.